Horizontal Style Chest Solid wood boards run horizontally and are spline joined tightly together. 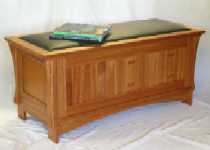 This Red Oak chest has a Harvest cushion top and original base. Panel Style Chest Solid wood book matched panels run vertically in Ogee profile rails and stiles. This Butternut chest has a Windmills cushion top and original base. Solid wood raised panels run vertically with a reeded design. 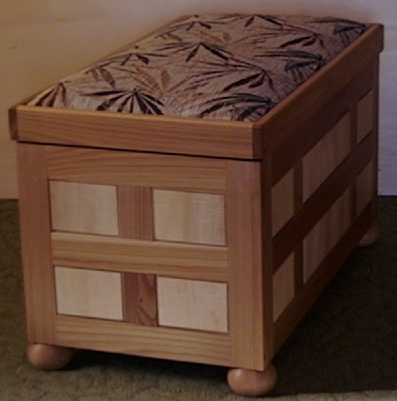 This African Mahogany chest has a customer's fabric cushion top and reeded bunn foot base. Vented Style Chest Solid wood boards run vertically with air spaces between them for ventilation. 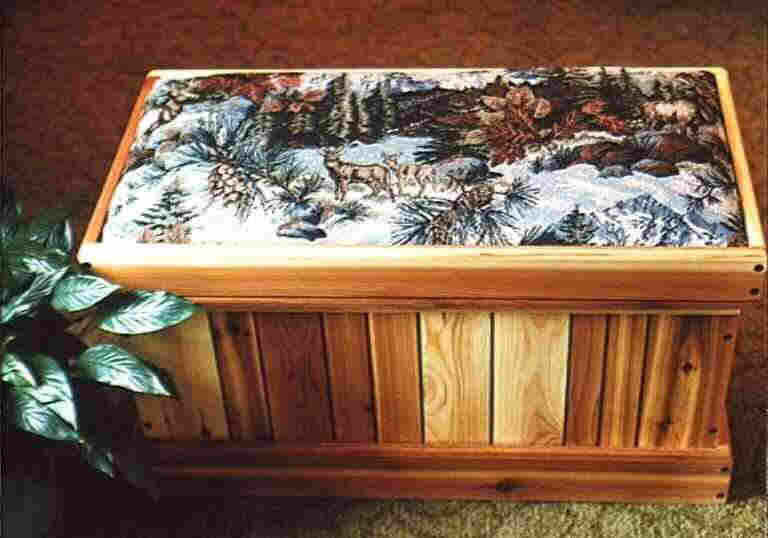 This Western Red Cedar chest has a pine needles cushion top and original base. Frame and Panel construction with bow tie inlay in the front panels, stretcher support in the base, and outside end corbels to support the lid. This African Mahogany Chest has a forest green low profile cowhide lid for beautiful and comfortable sitting. This is a custom wood shop and we may be able to make something special for you or your loved ones.